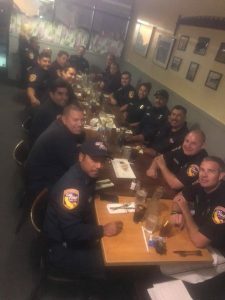 Update: Another large fire early November Roger and the Empire Grille crew fed the firefighters as needed until the fire was under control. Camping or hiking around Henry Cowell Redwoods State Park? Head over to Empire Grille, a family-friendly American restaurant that pays homage to the eating houses that filled the San Lorenzo Valley in the 1850s. The digs are modest and homey, with photographs and newspaper clippings that hark back to the era of miners and loggers. 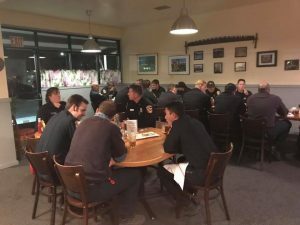 The menu, too, is simple and classic, with a selection of Small Bites ($7.75-$12) and hearty Large Bites ($19-$27). There’s no fusion and it’s not New American. Expect straight-forward, well-executed dishes, such as Braised Short Ribs in a carrot-flecked red wine sauce served atop mashed potatoes ($22), or a special of baked Pacific Salmon ($20) in a lemon, garlic and butter sauce. Portions are large and good for sharing. FELTON >> Empire Grille begins serving customers Wednesday, July 26, at 6149 Highway 9. It’s in the former site of Cowboy Bar & Grill, which moved down the road to 5447 Highway 9. Hours are 11 a.m. to 9 p.m. Sunday-Thursday and 11 a.m to 10 p.m. weekends. Lunch is served 11 a.m. to 2:30 p.m. daily; dinner 5:30-9 p.m. Sunday-Thursday and 5:30-10 p.m. Friday-Saturday. Update: Serving “Small Bites” and Burgers between Lunch and Dinner. Lunch selections include soups; salads; burgers (such as beef or wild salmon/rock crab, both also available at dinner) and sandwiches. Dinner items include signature chicken wings; Harris Ranch sirloin; braised lamb shank; and chicken Napoleon.